At least 2,000 people have crossed back into Liberia from Sierra Leone since United Nations peacekeepers deployed to the border town of Bo. The BBC's Jonathan Paye-Layleh says that the Mano River bridge has been busy with human traffic since the troops arrived. 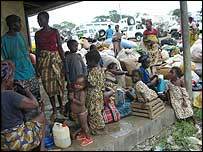 About 800,000 Liberians are waiting to go home after 14 years of conflict. Former rebels have joined a power-sharing government, which is due to organise elections next year. Some of the returnees are sheltering in a local clinic where there is just a single hand pump to provide drinking water. "I am very very happy for what I do see on the ground here today, I am very happy that I have come in today." "This is Liberia we fled before," said Boimah Kiawu, 40, with no shirt on and sweating profusely under a huge bundle as he crossed the bridge. "Our own people could not make this place a place for us to live in, foreigners [peacekeepers] have come to our rescue, we have no reason to doubt peace is finally here," he said. The head of the 10,000-strong UN force in Liberia reassured those going home that they would be safe. 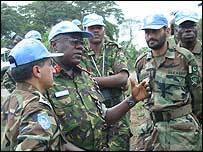 General Daniel Opande said the UN troops were now deployed in 12 of Liberia's 15 counties. "Our troops are now deployed here. You can go all the way to Monrovia, you can go to Gbarnga, Nimba or Zwedru," said General Daniel Opande. Our correspondent says that fighters from the Lurd rebel group are still in the town. But he says they do not display their weapons and have dismantled their major roadblocks, to show that authority rests with the UN force, Unmil.